The overall description of a Jordan Series Drogue (JSD) is included in the previous drogue post, from July 3, 2014. Now, here are design details related specifically to AUKLET. This includes the specs for the drogue itself, the arrangement for attaching the drogue to the boat when deployed, and a workable system for stowage. (This post is a little long, but it’s all written, and it seems silly to artificially divide it up.) First, the drogue itself. The standard table for calculating drogue specs does not go down to boats the size of AUKLET, whose fully loaded displacement approaches 4000 pounds. The table begins at 10,000 pounds, and goes up from there. However, Roger Taylor’s MINGMING, loaded for cruising, comes in at about 2000 pounds, and he has had a successful experience in severe storm use of his JSD. It has to be mentioned that, due to an incorrect knot and resulting chafe, he did lose this drogue partway through that first big test. Where he talks about this experience, in the book MINGMING and the Art of Minimal Ocean Sailing (pp 327-331), he concludes that the drogue functioned beautifully, regardless of the problem that he had with the knot. Reading the story, that sounds quite true, and as he says in the book, the knot issue is easily avoidable. His second drogue experience, described in MINGMING and the Tonic of Wildness (pp 63-73), was also interesting, though complicated by the issue of difficult retrieval. Regardless, based on his experiences in his smaller and lighter boat, I have felt good about working up from the specs that he shared. The first big design questions are the number of cones and diameter of the line to which they are attached. Roger Taylor used 87 cones, having extrapolated from the standard table, and then, happily, having had the chance to check this directly with Don Jordan (designer of the Jordan Series Drogue) who concurred with this number. Don Jordan has since sadly passed away, but he left us all lots of information with which to continue onward. Roger Taylor chose to put his drogue together with cones on 5/8 inch braided nylon, acknowledging that this was overbuilt – being the size recommended for boats displacing 10,000 pounds – but definitely sturdy. For further guidance, since I was planning to purchase a commercially built drogue, I had the opportunity to ask the folks who make them. One builder suggested 1/2 inch braided nylon, the other 5/8 inch. Interestingly, the builder who suggested the lighter line suggested 90 cones, and the builder who recommended the heavier line suggested 75. This smaller number for lightweight boats was arrived at through discussions that this particular builder had had with Don Jordan, specifically on the subject of JSDs for smaller boats, but it turns out that nobody, at least nobody known to that builder, has tested the smaller number of cones in a substantial storm. Since Roger Taylor’s version has been tested successfully with 87 cones, and MINGMING is smaller/lighter than AUKLET, I decided to go with 90 cones. Also staying conservative, I chose 5/8 inch line. I ended up choosing the builder in England, Roddy Coleman at http://www.oceanbrake.com, partly because the price was better than the other folks’, even with shipping from England, and partly because he was already familiar with making bridles suitable for connection to attachment plates, and had a price readily available for doing it, which demonstrated to me that this was indeed routine for their shop. 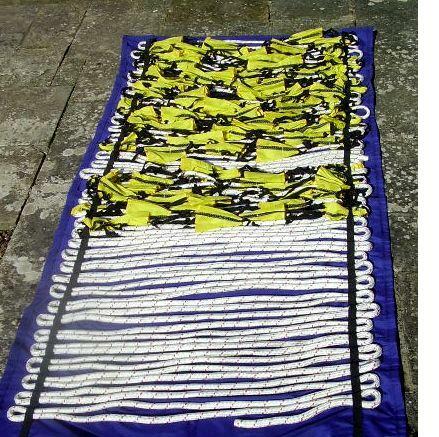 They also have a rollup storage bag available, which seemed like a really good idea. 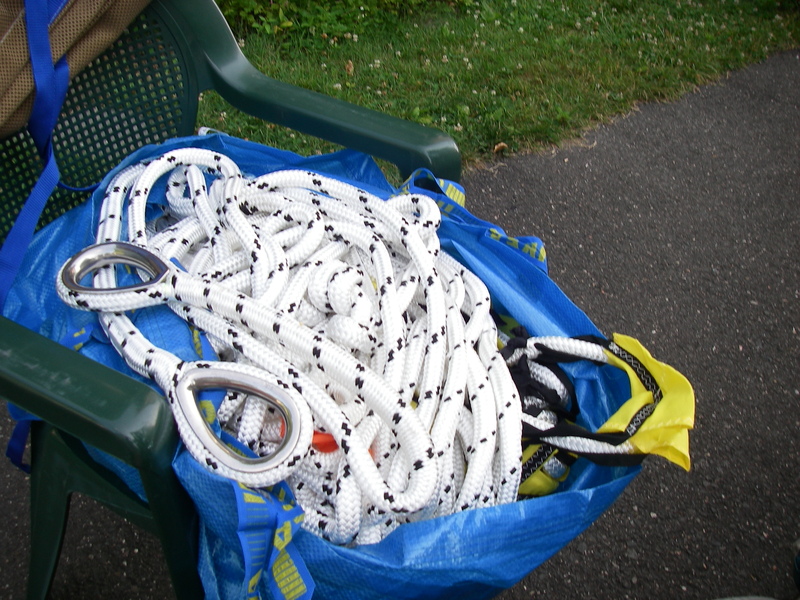 Roddy and I settled on those combined, conservative specs, of 90 cones and 5/8 inch braided nylon, with the standard recommended lengths for the section with cones, the long pennant, and the bridle legs. 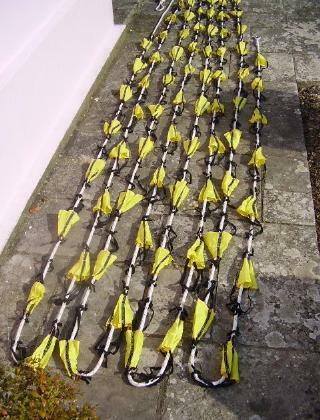 90 cones at 20 inches apart = 150 feet, plus an additional bit for eye splices at each end, for attachment to the pennant at one end, and to 15 pounds of chain at the end farthest from the boat, to keep the drogue underwater when deployed. Now it’s a few weeks later, and the completed outfit is here in Holyoke. Then there is the question of attachment to the boat, which has been the most complicated part of this project to figure out. Some folks handle this connection by leading the plain bridle ends, with chafe protection, to cleats at the stern quarters. Others put eye splices with heavy metal thimbles on the ends of the bridle, and attachment plates bolted to the back of the boat, for connection with shackles. This is the version that I like, because it avoids the problem of chafe. One of the biggest challenges in setting up the shackled version is sorting out the attachment plates. Roddy at Oceanbrake has chainplates available for this use, but they are too big for my small boat. Looking at coming up with something more locally meant figuring out what was appropriate in terms of width, length, and thickness. That took some doing! Related to this is the question of what shackles to use, and in the end the shackle size helped to determine the chainplate answer. Roger Taylor said that he scavenged 1/4 inch thick bronze shroud chainplates from a large boat, fastened with three 1/2 inch bolts, but he didn’t mention the other dimensions. Then the most helpful item that turned up, for me, was this write-up on the subject of shackles and their use: http://practicalmaintenance.net/?p=766 After that, for a specific shackle, it was back to this one: http://www.bairstow.com/v/vspfiles/pdf/specs/G209A716.pdf This page also includes a general table of shackle specs. In dealing with shackles, it’s very important to note that the “size” of the shackle is NOT the pin diameter. The pin diameter is actually larger than the labeled shackle size, which is based on the diameter of the bow part of the shackle. So in thinking about what size shackle to actually order, it’s important to look up the pin size that will fit. It’s annoying, to receive shackles that don’t fit the hole you have in mind – I’ve done this before! Based on all of that information, using alloy shackles that would fit in a 1/2 inch hole, we could have a maximum safe working load of 2.66 metric tons, which comes out to 5,866 pounds. That’s overdone, but consistent with nice heavy 5/8 inch line. And very relaxing. Also, that working load figure is for a straight line pull. As discussed in the “practical maintenance” article linked above, if the pull is from a 90° angle, the safe working load for a shackle is half of the stated figure. This isn’t likely to happen in this situation, given the overall bridle arrangement, but it’s nice to know that if it did, the shackle would be up to it. The other nice thing about this size shackle is that the opening, where the pin goes, is just wide enough to fit over the 5/8 inch line and thimble where the shackle needs to connect to the bridle. The next consideration is determining the thickness of the chainplate that should go together with this shackle, and finding what’s actually available. This entire design process is a little bit like origami – you try out one parameter, see how it fits with the others, try out what works for something else, and work your way back to make them all go together. Design necessity, and size availability, for each individual part, and then for the completed whole, all need to match up. Along the way in this process I went through trying out the possibility of a 1/8 inch thick chainplate intended for sailboat shrouds, but it seemed flimsy for the job. Then I read that if a shackle is connected to a metal bar, the bar thickness must be at least one half the diameter of the shackle pin, to prevent deforming the bar under load. Since a shackle with a 1/4 inch pin would not be strong enough for the proposed load – and isn’t even available in high quality shackles shown in the above links – the chainplate would definitely need to be thicker. For a while I contemplated having chainplates made. Not living presently near a nice, working shoreline (Narragansett Bay would be different!) this was not simple. Looking into metals, with thoughts of making it here, it was even less simple – load ratings are dependent not only upon what the metal is made of, but how it is treated for hardness and who knows what else. I definitely didn’t want to be out in a storm somewhere wondering if the chainplates were going to crack because they were the wrong particular metal. Back to following Roger – thank goodness for his work! – the field narrowed to 1/4 inch thick chainplates originally produced for sailboat shrouds. Availability narrowed the field the rest of the way – I’ll bet that a nice consignment shop by the ocean would have something workable, but again, here we are. And the advantage of new is that you don’t have to worry about possible metal fatigue from previous use. In bronze, you could likely see any problem, as it deforms before breaking, but stainless could go from looking just fine to cracking in pieces. Anyway, here we are, still, in Holyoke… no marine consignment shops in sight. So it was back to the online marine catalogs. As it turns out, there aren’t a whole lot of choices. 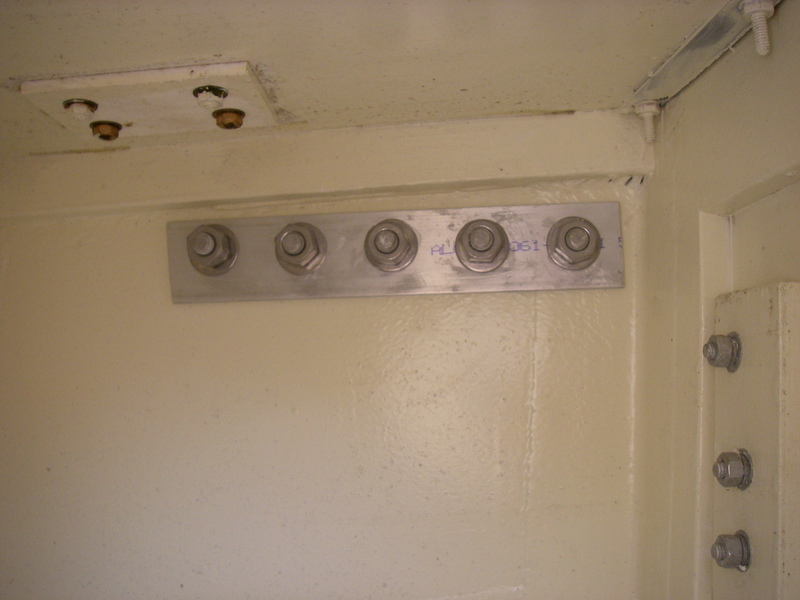 In order to have 1/4 inch thick plate, you then get 1/2 inch holes – one for the shackle, and five for bolts. At least we know that once bolted on, this plate is definitely not going anywhere! The other dimensions are fixed at 1 1/2 inches x 14 inches. There was a question about getting the kind of chainplate with an angle at the end, to accommodate the angle of the bridle. But doing a mockup of the bridle demonstrated that the narrowing of AUKLET’s stern actually made the straight chainplate more correct. There was in the end only one choice available (that I could find), which is made by Schaefer, and fortunately it looks good. The chainplates are now installed, with 1/4 inch x 2 inch aluminum backing plates. This is material that I happened to have already, but I like it anyhow. Somewhere I read – maybe Don Casey? – that mixing metals for a backing plate is not such a bad thing, because it will only corrode if water gets in there, and if water is getting in to the back of your installation, you want to know. So with an aluminum backing plate, the white corrosion will be noticeable if there is any problem. With the aluminum at 1/4 inch thick, it feels hefty enough for the job. Commercially available larger chainplates also have the same problem. For some reason the manufacturers choose not to set the hole back a little further, which would help quite a bit. This is tricky, because the easily available larger rigging chainplates all seem to be done this way. It’s something to keep in mind, if one is setting up something like this for a bigger boat. 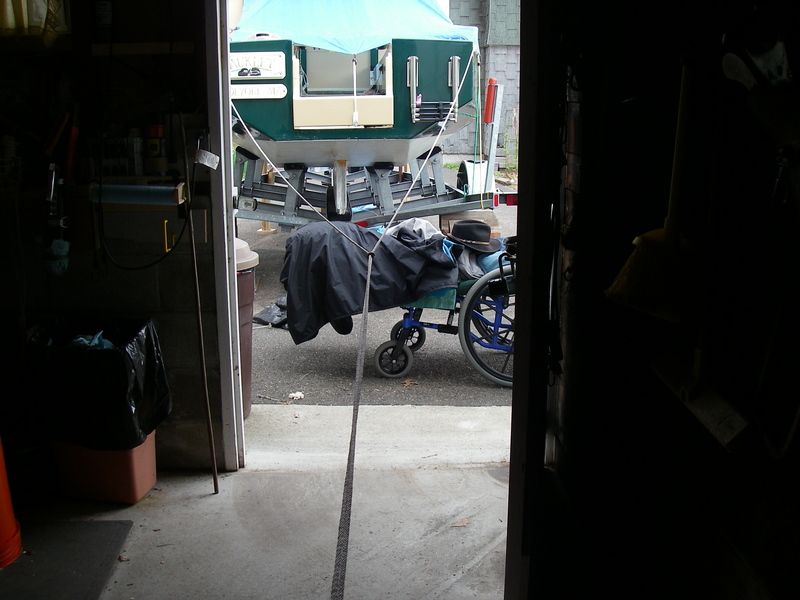 The photo in the link above also shows the chainplate mounted horizontally – I would emphatically offer that, in my humble opinion, the chainplates should be mounted on the sides of the boat, so that the up-and-down motion of waves will be easily accommodated by the shackle. It’s important to note that, as shown in the previously mentioned “practical maintenance.net” reference, something needs to be in place to keep each shackle centered on the chainplate. Some folks weld spacers onto the chainplate, though other folks talk about that there could be some concern with affecting the hardness and load rating of the chainplate in the process of heating it for welding. Stacked washers are also acceptable, and somewhat simpler. In our arrangement, three washers on each side of the chainplate comfortably fill the gap (see photo above). To make them easier to manage during repeated installation, we are sticking each stack of three together with a little bit of caulk in between the washers. 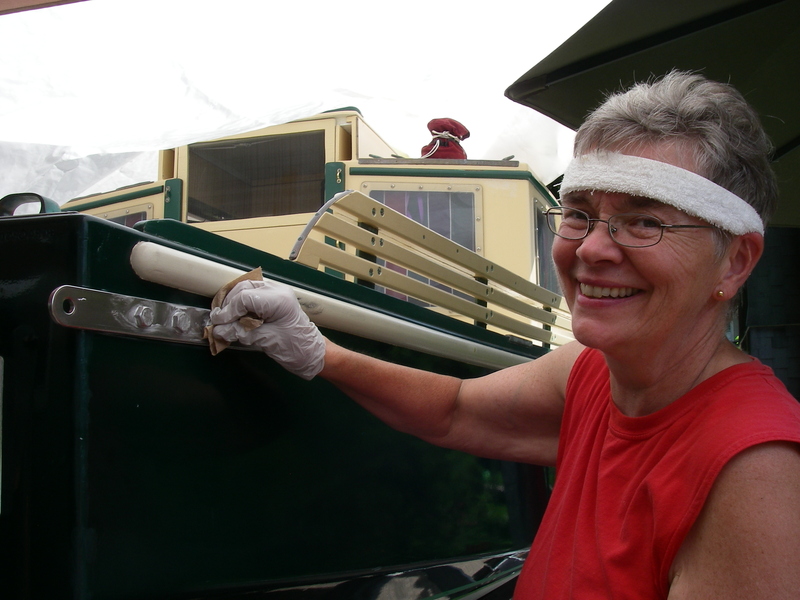 Here’s the starboard drogue attachment plate, and Suzanne cleaning off the last of the caulk just after she and Theo got the whole thing bolted in place. Thanks to both of them – and to Theo for the great photo! Once the drogue and its attachment to the boat have been worked out, there is the question of storage when not in use. Ideally, one can find an arrangement that allows for the bridle to be already shackled to the attachment plates, ready to go in case the whole thing is needed, and set up before venturing out where that might come up. For drogues that are fastened to the boat using bridle lines led to reinforced cleats, this isn’t such an issue (the issues in that situation come later, with potential chafe). But with the shackles to attachment plates arrangement, it’s not going to be so easy to reach over the back of the boat and attach everything while underway. At the same time, once they are in place but not being used, it’s good to have the bulk of the drogue stored safely out of the way, at the same time as still being readily available. All that is a tall order, on a small boat! In addition to these factors, if the drogue does get used it’s going to come back soaking wet, presumably while there is still sailing to be done in a certain amount of remaining wind. My experience with braided nylon dock line has been that it’s almost impossible to get this stuff to dry, even wet with fresh water, and never mind with salt. The drogue storage is going to need to take this into account too. Latest thinking on the entire storage question has been a sealable opening into the port cockpit locker, with a plastic tub below. Originally I was thinking of a large deck pipe (screwed down metal fitting, over a hole into a locker, with a nice removable metal cap), like the oval kind for anchor line and thimbles, and a cover that could be taped closed. But if the drogue is set up ready to go, there are going to be two bridle lines needing to lead into that special opening in the side of the deck pipe cover, or else the entire length of the bridle lines will need to stay out somewhere in the cockpit. The deck pipe and cover could be modified to allow for including both bridle legs, but then there is the more serious problem: the deck pipe will be easy enough to tape closed when everything is dry – but being able to do that in a storm is highly unlikely, with wind and waves and everything soaking wet at the time of drogue deployment. That’s the last time in the world that you want an extra hole in the deck that could allow a whole lot of water into the interior of the boat. Plan B is evolving into a 4 inch plastic deck plate with a threaded cover, mounted on the vertical face of the cockpit bench, so that the deck plate opens into the port cockpit locker. This would be arranged with a regular flat screw-in plate for closing things up completely, and an alternate plate that has had the middle cut out, and the cutout area replaced with a waterproof coated fabric sleeve. The drogue bridle can be passed through the sleeve into the locker, and then the sleeve can be lashed snugly around both lines. 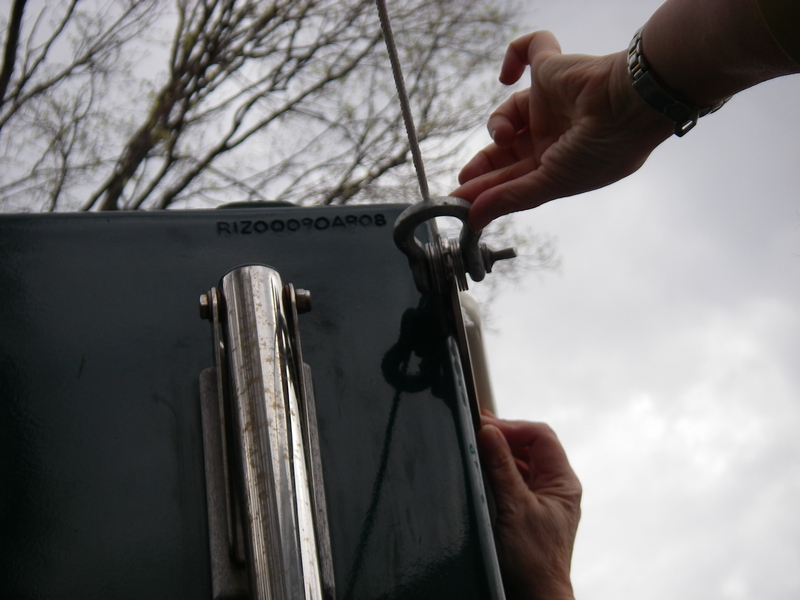 For deployment, the lashing can be undone, and the drogue, previously arranged in its tub, can be drawn out through that sleeve, without having to open the locker. This is still in development. With stuff like this going on, besides the junk rig and the steering rehab, it’s abundantly clear why the boat is still in the driveway, even though it’s the beginning of July! But it’s really interesting working it all out, and I’m having a tremendous time being home for part of the summer (and berry season!) for the first time in three years. Last year we put in a bunch of time installing a big Whale bilge pump, and this year it’s the drogue. It’s funny to put so much work into something that will very possibly never be used – but the peace of mind feels worth every bit of the effort.